Forty-nine people have been sentenced to prison over a series of huge explosions in the northeastern Chinese city of Tianjin which killed at least 165 people in 2015. 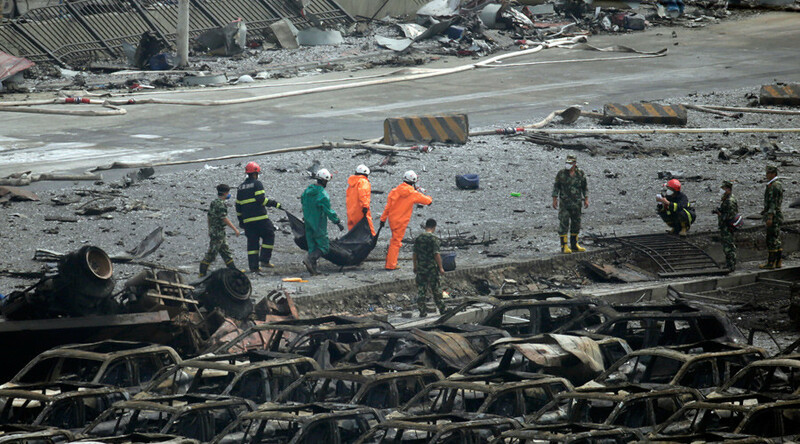 A Chinese court sentenced 25 government officials and 24 company managers over the massive blasts in Tianjin warehouses last year, the Xinhua news agency said on Wednesday. The explosions occurred shortly before midnight on August 12 2015, when two enormous explosions erupted from a shipment of explosives in a container storage station in the major transport hub. The first blast had such ferocity that it registered as a 2.3 magnitude earthquake according to China’s National Earthquake Bureau. It was equivalent to the detonation of 3 tonnes of TNT. The second explosion, which took place about 30 seconds later, dwarfed the first bang. It was equivalent to the explosion of 21 tonnes of TNT and it unleashed a fireball that rose hundreds of meters into the air. A further eight smaller blasts took place as fires spread throughout the facility. The shock waves shattered windows in nearby offices and apartment blocks, and the impact was felt up to 10km away. Images released by state media showed evacuated people running in the streets. Dozens of firefighters were among the dead and missing following the devastating explosions. A team of military specialists trained in handling nuclear and biochemical materials were called to the site to help deal with the fallout as sulfur oxide, carbon monoxide and nitrogen oxide were found in the air. The sentences handed down on Wednesday range from a one year in prison to a suspended death sentence, which is generally commuted to life in prison, Reuters reports. The most severe punishment was given to the chairman of the facility’s operator, Tianjin Ruihai International Logistics Co Ltd.